41 Over on Tchoupitoulas, just four blocks from the Quarter, is the newly opened Old No. 77 Hotel & Chandlery, where elements of the former coffee warehouse are seen in its exposed brick and wooden floors. Chef Nina Compton, a contestant on BRAVO's "Top Chef" and a native of St. Lucia, combines her Caribbean upbringing to fabulously fuse with New Orleans flavors in the hotel's Compère Lapin restaurant. If you must stay in the French Quarter, the New Orleans Hotel Group offers several, and they range from the elegant, discreet—and expensive—Audubon Cottages to the chic Hotel Le Marais. Visit www. neworleanshotelcollection.com for a complete list. To find special deals on all New Orleans hotels, visit www.neworleansonline.com and click on Special Offers under Popular Links. When it comes to food, it's difficult to find a bad meal in New Orleans; its delicious culinary fare ranges from hip and celebratory to inexpensive holes in the wall. We're suckers for tradition, so dinner at Brennan's or Arnaud's is where we'd head for a romantic evening. Brennan's reopened last year and is now helmed by co-owners Terry White and Ralph Brennan and sporting old-world sophistication with a modern facelift. Chef Slade Rushing serves up Creole favorites the restaurant has long been known for but has tuned up the menu as well. As always, service is excellent. Start with the signature cocktail French 75 at Arnaud's French 75 Bar, a combination of Courvoisier VS, sugar, lemon juice and Moet and Chandon champagnes. Head to the main dining room or one of the many private rooms for a traditional Creole New Orleans meal, followed by bread pudding and café brûlot. Conclude the evening with live Dixieland jazz in its Jazz Bistro or a tour through the restaurant's Mardi Gras Museum. For those on a budget, you won't have to sacrifice taste. 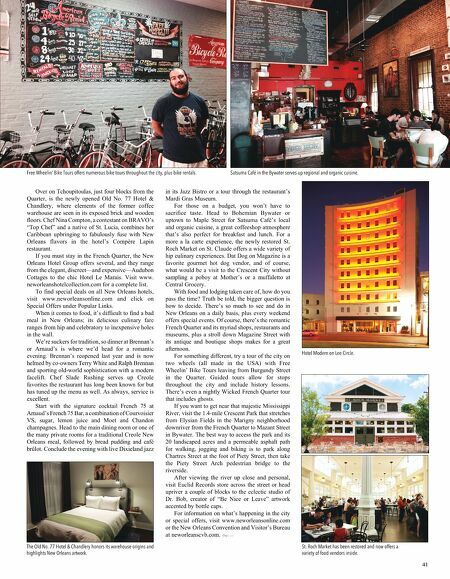 Head to Bohemian Bywater or uptown to Maple Street for Satsuma Café's local and organic cuisine, a great coffeeshop atmosphere that's also perfect for breakfast and lunch. For a more a la carte experience, the newly restored St. Roch Market on St. Claude offers a wide variety of hip culinary experiences. Dat Dog on Magazine is a favorite gourmet hot dog vendor, and of course, what would be a visit to the Crescent City without sampling a poboy at Mother's or a muffaletto at Central Grocery. With food and lodging taken care of, how do you pass the time? Truth be told, the bigger question is how to decide. There's so much to see and do in New Orleans on a daily basis, plus every weekend offers special events. Of course, there's the romantic French Quarter and its myriad shops, restaurants and museums, plus a stroll down Magazine Street with its antique and boutique shops makes for a great afternoon. For something different, try a tour of the city on two wheels (all made in the USA) with Free Wheelin' Bike Tours leaving from Burgundy Street in the Quarter. Guided tours allow for stops throughout the city and include history lessons. There's even a nightly Wicked French Quarter tour that includes ghosts. If you want to get near that majestic Mississippi River, visit the 1.4-mile Crescent Park that stretches from Elysian Fields in the Marigny neighborhood downriver from the French Quarter to Mazant Street in Bywater. The best way to access the park and its 20 landscaped acres and a permeable asphalt path for walking, jogging and biking is to park along Chartres Street at the foot of Piety Street, then take the Piety Street Arch pedestrian bridge to the riverside. After viewing the river up close and personal, visit Euclid Records store across the street or head upriver a couple of blocks to the eclectic studio of Dr. Bob, creator of "Be Nice or Leave" artwork accented by bottle caps. For information on what's happening in the city or special offers, visit www.neworleansonline.com or the New Orleans Convention and Visitor's Bureau at neworleanscvb.com. Free Wheelin' Bike Tours offers numerous bike tours throughout the city, plus bike rentals. Satsuma Café in the Bywater serves up regional and organic cuisine. St. Roch Market has been restored and now offers a variety of food vendors inside. Hotel Modern on Lee Circle. The Old No. 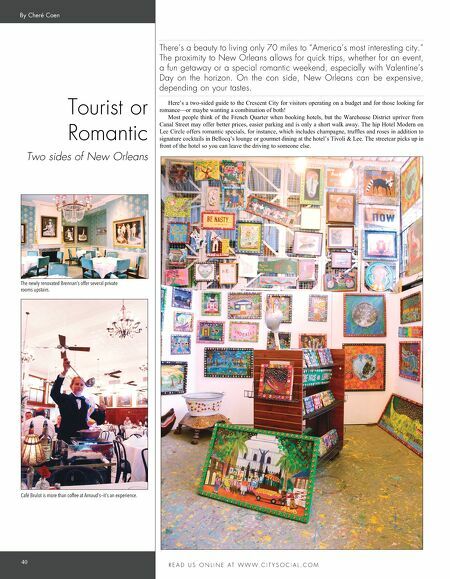 77 Hotel & Chandlery honors its warehouse origins and highlights New Orleans artwork.